France is the largest country in western Europe so train travel makes sense. Happily, France has a fast and efficient train system and the French government has invested massively in high-speed trains (the TGV train or Train a Grande Vitesse), and on high-speed lines (LGV or Ligne a Grande Vitesse). There is over 1700 km (1056 miles) of dedicated high-speed lines and thousands more of main lines and smaller lines so almost everywhere is accessible by train travel in France. The French rail network links all the major towns while also linking up many small towns in rural France. With careful planning, you can get around just using train travel during your vacation. Generally, the trains are on time, comfortable and relatively cheap. However some trains run only at certain times on certain days, so you need very careful planning if you are traveling in rural France by train. Like many capital cities, Paris suffers from having no central railway hub, but a number of mainline termini. Here are some of the main destinations served from the main stations. 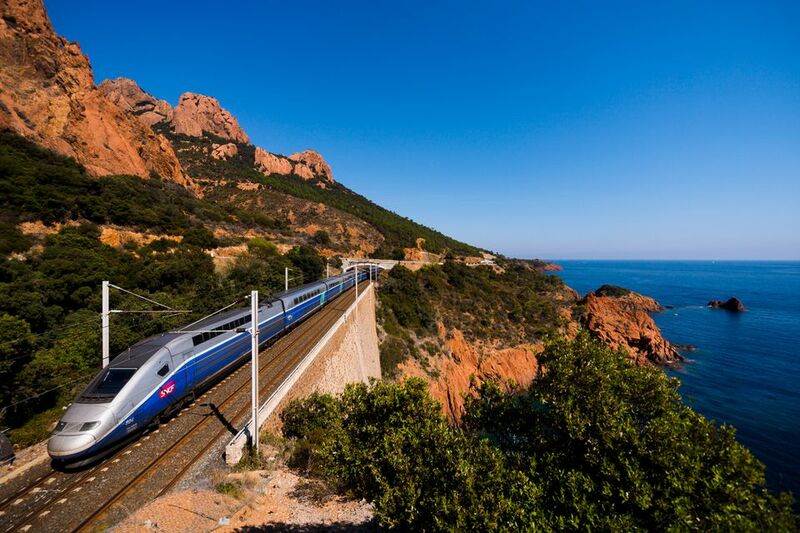 All types of trains run in France, from the impressive TGV train and other high-speed trains to smaller branch lines. While there are still some lines operating old carriages, most of the trains are now comfortable, modern and have high tech additions like WiFi. Many have massive picture windows along the sides; others have an upper deck which gives you a wonderful view of the French countryside you are powering through. The TGV Train network (Train a Grande Vitesse) runs to major cities in France and Europe. Intercites trains cover many of the medium distance routes between cities like Amiens, Orleans, Bordeaux, Caen, Lyon, Reims, Troyes, Toulouse, and Paris. They link cities in French regions like Nantes, Bordeaux, and Lyons-Nantes-Tours. TER is the French regional service running from towns and villages over 21 regional networks in France. AutoTrain sleeper service runs from Paris Bercy Station down to the south of France taking you and your car. Like most countries, ticket prices vary widely. If you can book early you will get good bargains, but you may well have to stick to a specific time. If you book that and miss the train, you may not get reimbursed. Ticket prices are no higher on a TGV or express train than on a normal local line. And to compete with the low-cost airlines, TGV trains offer good prices for early bookings, and for the less popular times of trains. Internet booking is always a good idea. All French train tickets can also be ordered online and you can then print them out on your computer as an e-ticket, exactly as the airlines do. Visitors from the USA can buy online with Rail Europe and visitors from the UK can buy online with Voyages sncf (formerly Rail Europe UK). Arrive early to find out which platform the train goes from. Paris train stations can be quite confusing. There might not be good refreshments on the train; check in advance and if necessary buy your own snacks/light lunches at the station. You will have to validate your ticket. Look for the yellow machines (‘compostage de billets’) usually just before you reach the platform. Insert your tickets into the slot and retrieve it. Ticket inspectors will check your ticket on the train and if it is not validated will probably find you.